The spacious 100 square-inch grilling surface of the Hamilton Beach® searing grill heats up to 500°F, instantly searing steak to seal in its flavorful juices, then grilling it to perfection. Most grills can't sear steak properly, since they typically only reach 400 F. The searing heat and surface pattern imprints the steak with grill marks for that "steakhouse" look. The grill is also perfect for grilling other meats, vegetables and fish. 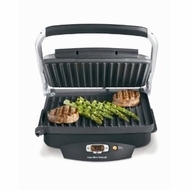 The Hamilton Beach® searing grill makes quick meals and is easy to clean. The grill-surfaces are coated with an easy-to-clean nonstick surface, and the grill is equipped with a dishwasher-safe drip tray. The Hamilton Beach® searing grill has a digital display and adjustable temperature controls. Its floating hinge can accommodate foods of any thickness, so foods won't crush.